When you see at the store a bunch of beets with the greens still attached to them, you know they are as fresh as it gets. Nevertheless, the fresh greens are not just an indication for the beets’ freshness; they are also edible and tasty on their own right, so it makes even more sense to buy the bunch. Here, I have used the bunch to create two dishes: a colorful roasted beets salad and savory beet greens cheese patties. Both dishes go great together, but you can, of course, serve each on its’ own. 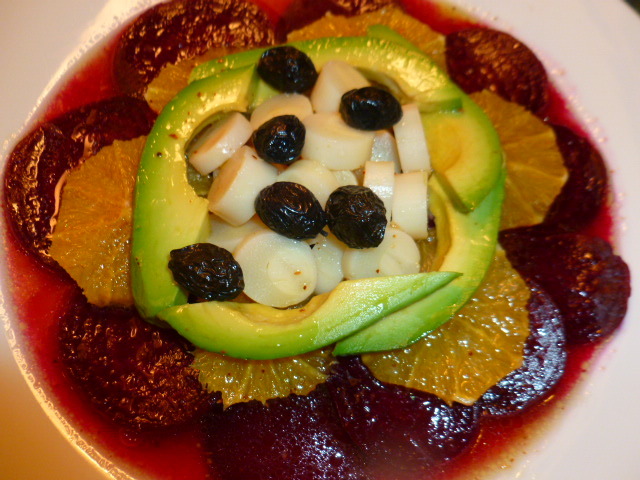 This colorful salad is best served immediately after preparing it, as the beets will slowly change the color of the other ingredients. If you want to make it ahead of time, keep the ingredients and dressing separately and assemble the salad before serving.